The first introductory public policy text with a strong economics perspective. A new textbook by Charles Wheelan, author of Naked Economics, Introduction to Public Policy uses economic principles to demonstrate that sound public policy occurs when unfettered private markets provide the greatest good for the greatest number. Only when it does not do this is government intervention needed. Public policy is the process by which groups act collectively—from declaring war to installing stoplights. Introduction to Public Policy is the first textbook to put this process into an economic framework. The book includes chapters on collective action, welfare and social choice, the role of government, and more. It also includes discussions of economics principles such as the power of incentives, moral hazard, and the prisoner's dilemma. 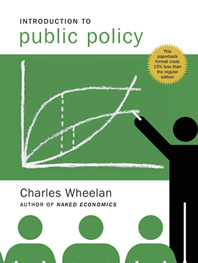 Charles Wheelan is the author of Naked Economics, a perennial favorite of students and general readers, praised for its readability. In Introduction to Public Policy, the author employs the same engaging tone and narrative style. •	do community-college degrees raise wages? Statistical analysis is the most important tool for a public-policy participant to possess. In Introduction to Public Policy, the level is just right, and the presentation is ideal for the introductory class. Section I: What Is Public Policy? Chapter 2: Why Is It So Hard to Make the World a Better Place?